“Reported in 1 matches by 3 different parties”. Evidently, that game was a bad one. With the introduction of the ranked role queue in Dota 2 for Dota+ members, I’ve been playing ranked for the first time in years. You can say what you want about Dota+ as a whole, and I’ll be equally as honest and say that there aren’t that many tangible benefits, but ranked roles improves on a crucial aspect of the ranked queue experience by guaranteeing you’ll be able to play a particular role and lane. By removing that extra potential point of friction, you could argue that it’s a little pay to win, but it’s perfect if you want to grind out tens of games on a particular hero. Which is exactly what I’ve been doing. Much to the chagrin of my teammates, I’ve been picking offlane Luna and relying on a good support to do well enough to get past the laning stage, at which point I’ll focus on pushing out the lanes and creating space — either until my team’s real carry has enough farm to carry the game, or until I get big enough to feel that I can. And it’s been working. Kind of. 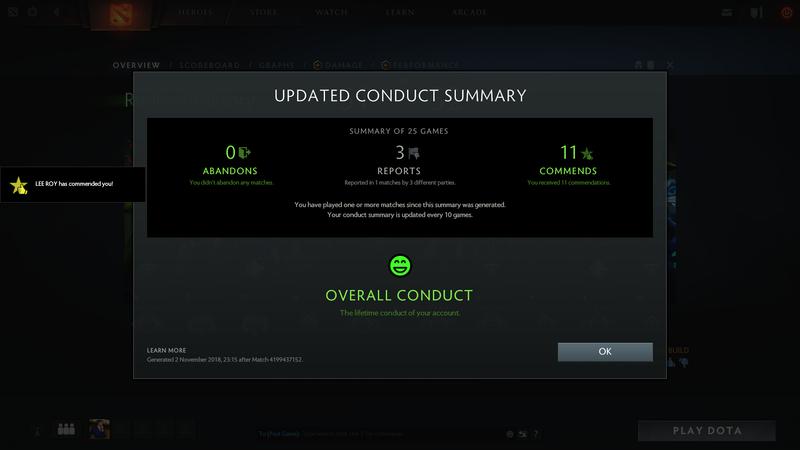 Dotabuff says I’m 13-9 on Luna in ranked games over the past three months, and while I’ve only played one game since patch 7.20, it’s early enough in the patch, here’s hoping that I’ll be able to get away with it until early 2019. Even though I consider myself pretty good at pushing out the lanes and making space with a carry that can farm, this tactic of picking offlane Luna isn’t exactly winning any popularity contests. Unless my team wins, in which case all is forgiven, but losing inevitably makes me the prime target for most of the blame. So even though I know what I’m doing — playing a carry from the offlane position, making space for our “real” carry, even if that turns out to be me — some of the time, my team isn’t on the same page, which leads to mistakes and pickoffs, which often leads to some very unhelpful suggestions in chat. I’ve said before that ranked is a festering cesspool of the worst Dota 2 players, which carries the unique distinction of being the only game mode where you can literally measure how good you are at the game, relative to everyone else, either via the ranked medals they introduced a little while ago, or via the MMR that you see on your profile page. My thoughts on that haven’t changed — I continue to believe that ranked is the most toxic game mode in Dota 2, like any competitive mode in any other game — but on the other side of the scale is my own willingness to improve in a game that I’ve spent thousands of hours in. I cannot believe how truly awful I am at a game for the amount of time I’ve spent playing/watching/reading Dota. It’s actually unbelievable, and the only reason I haven’t quit altogether is because I know I haven’t played anywhere near enough to be good (and also because no one really quits Dota). If you want to get better, you play, and that often means playing a lot. And so, if you want to see how good you are at Dota, or measure how much you’ve improved in any way, shape, or form, you play ranked.